Enerpac (A Division of Actuant Corp) introduces a new line of 700 bar electric pumps designed to save power and enhance reliability for operation in harsh environments. 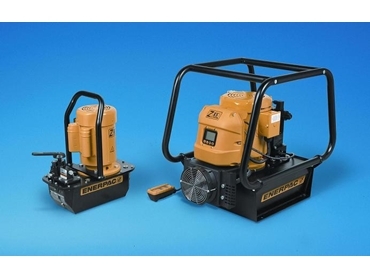 The ZE series of 700 bar electric pumps from Enerpac is engineered for lower power consumption. By reducing the number of moving parts in the construction, the pump offers increased reliability in performance in addition to enhanced flow characteristics and reduced friction. The new ZE series of electric pumps for industrial applications follows the global success of the Enerpac ZU series electric pumps designed for the construction market. Enerpac says the Z-Class range of electric pumps incorporates the latest metallurgical bearing and seal technologies to produce a superior grade of pumps. Operational life of the electric pumps is extended through a reduction in the number of moving parts, improvement of flow dynamics and decreased friction. Application-specific models of the electric pumps are available through different valve and reservoir configurations that enhance the pumps’ versatility to match specific industrial requirements. ZE series electric pumps are available with a wide range of accessories including heat exchangers, roll bars, pressure transducers as well as level and temperature switches to allow complete pump control over a wide range of industrial applications. Enerpac is a major supplier of high-pressure 700 bar hydraulic equipment in Australia and New Zealand.